Home Cricket Articles Anil Kumble as India coach: BCCI’s two-facedness out in the public? Anil Kumble as India coach: BCCI’s two-facedness out in the public? bowler, as selfless as he was a team-man and as fierce as he was an opposition. However, if we can somehow manage to sail past the waves of emotions, we should be able to ascertain the two-facedness of BCCI that is making all the efforts to cleanse its tattered image in the eyes of public. 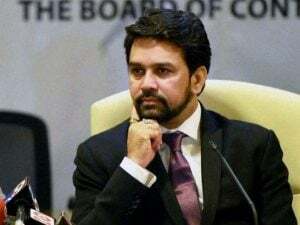 Vividly so, in his new avatar as the supreme commander of Indian Cricket, Anurag Thakur has pulled the board out of opprobrium. But a thorough check should reveal otherwise. For instance, remember the way the board started out with its quest to find the most suitable person to coach the Indian Cricket Team? Advertisements were rolled out, terms were laid. Applications from around the world were invited and a committee was set. All to ensure that the process remains transparent and productive. Or at least they pretended so. whose first two major criteria you do not meet? Yes, there can be exceptions in cases of extra ordinary applicants. But doesn’t the job to coach the Indian Cricket Team hold an equal importance? Among many responsibilities of a coach, one is to maintain the order in the team so that no one breaks the rules. Then why should one be allowed to jump the red light when he is going to appear for the job of a traffic inspector? Before making his debut for India, even Sachin Tendulkar had to sweat in domestic tournaments. A great player can not necessarily become a great coach. Have we forgotten the Greg Chappel saga (No! I am not comparing Kumble to him at all)? Why did the board go through the troubles of preparing the list of requirement and posting an advertisement at all when they had to stick with someone who didn’t even qualify to apply? Was that all just an attempt at resurrecting the tarnished image of the board that dealt with a series of accusations for being not at all transparent with its functioning. Let’s not be that harsh on the man though. He deserved the position as much as others. But then how much time he has in his hands? An year? For a person who would be starting from basics with no prior experience, how do you expect him to deliver in just 12 months? If he does, that would be his brilliance around the red cherry. But from everything that happened in the past, BCCI doesn’t appear to have learned much. Hypocrisy at the administration level is still eminent. Commerce remains the supreme interest. Board has just announced another mini-IPL around September. And above all, Lodha Committee’s reports and recommendations lie amid dusts of ignorance in archives. For cricket to remain the premiere source of entertainment it has to maintain its primitive class and the richest cricket board in the world is more concerned about the popularity of IPL. There have been few exceptions like identifying new test venues and helping the game reach small cities. But for a more rewarding adventure, board will have to demonstrate its honest endeavors. There is energy in the administration with a young president at the helm of affairs. The rules need to remain intact. Now is the time to stand behind the new man-in-charge Anil Kumble. For him the job should be a lot easier than anyone else considering his experience as the captain of Indian Team not so long ago. My eyes will be on the newer breed of leg-spinners- an endangered species. We have an Indian coach after 16 years. Much has changed in the world cricket. Players have matured. Regional favoritism has vanished from the dressing room. Cricketers are coming from smaller towns and IPL has given them an access to the entire world. They have been mentored and directed by a lot of coaches around the world for their league teams. What remains to be seen is how Kumble’s intelligence would be exploited by the team members. Let’s hope for a better and cleaner game of cricket. Next articleA hope of survival- A tale of cricket on the land of dead!